I believe every human has a creative and artistic side and I am not an exception. About fifteen years ago when I baked my first cake in a pressure cooker, I did not even dream of becoming a professional cake baker. After coming to the United States seven years ago I decided to experiment with various hobbies that would keep me occupied while my husband was busy tapping the keyboard. It was such an experiment to take a few cake decorating classes at Michaels that changed my life. I was fascinated by the way sugar could be transformed into so many wonderful shapes. My teacher Janice was very helpful and encouraged me to improve my creations every time. She was very happy with the way I performed the decorations and also motivated me to think about becoming an instructor. Many of my friends encourage me to use this talent and come up with new designs to suit their occasions. When I am able to transform their requirements into a reality it gives me great satisfaction. 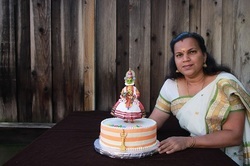 I am always happy to work with you and make your next dream cake come true. Together we can make your next occasion unforgettable. Thanks you for stopping by my website. Please do checkout my cake pictures and flavor list.